If you’ve ever been to a church bake sale, chances are you’ve seen these no-bake cookies or something similar. I’m a huge fan of no-bake desserts (Chocolate Peanut Butter Haystacks, anyone?). 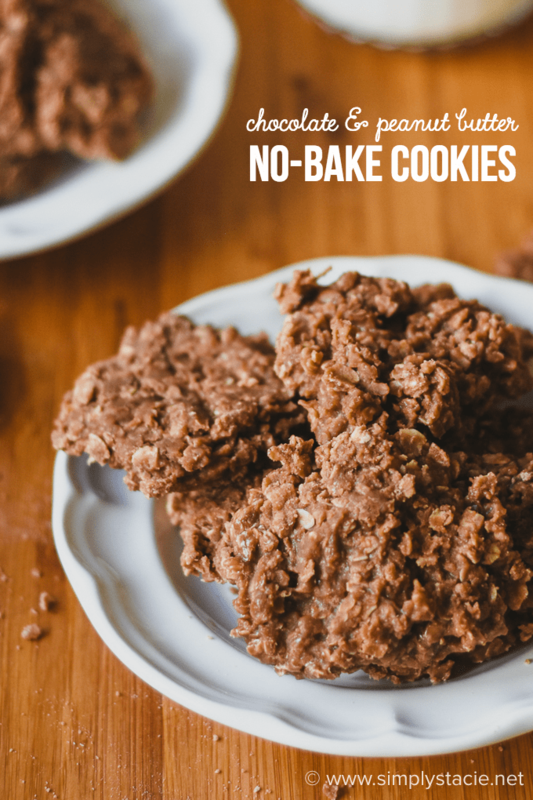 These Chocolate & Peanut Butter No-Bake Cookies are rich, chewy and easy to make. They are the kind of cookie you make one time and never forget the recipe. (If you do forget, just come back to this post!). Craving more no-bake desserts? You’ve come to the right spot. Check out my other recipes like No-Bake Nougat Bars, Rocky Road Bites, Cherry Mousse, Strawberry Mousse, Lemon Cheesecake Mousse, White Chocolate Peanut Butter Cheerios Treats, Strawberry No-Bake Cheesecake and Goldfish Drops. 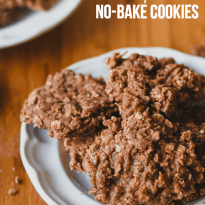 What is your favourite no-bake cookie? Rich, chewy and easy to make! Make these cookies once and you’ll never forget the recipe. Combine the cocoa, sugar, margarine and milk in a saucepan. Over medium heat, bring to a full boil and continue to boil for 2 minutes. Remove from heat and add the quick oats, peanut butter and vanilla, stir until combined. Working quickly, drop by the tablespoon on waxed paper and allow to cool before serving. One of my favorite cookies to make and eat! Oh maybe that should be the weekend snack. These look delicious…and I think I have all the ingredients in the pantry! These look delicious!! Bonus is I can’t burn them!! This is one of my favorite cookies but I don’t make it often. I am the only one in my family who loves them. What is wrong with my family????? Chocholate is my favourite one, even no bake cookies… its really yummy…. thanks for recipe…. let me try! Your recipe is similar to the one I got from my MIL. I never had these growing up but now they are probably my favorite cookie! I should give these a try sometime, they sound delicious! We call these cookies Lunchroom Cookies – we had them every Friday in the school lunch. they are my favorite cookie. Yes, I always search for them at bake sales. Pinning and sharing! Oh I wish there was a “taste” button on the computer! I would love for you to share this gem of a post on Thoughts of Home on Thursday. I love these cookies! My first experience with them was at school and the love affair has lasted through the years! . My comment from the other day didn’t show up, so I will try again. I was asking my sister for the recipe for these cookies that were simply called School Cookies growing up. All of our school system’s cafeterias made this daily, so we all loved and still love it. She had just sent me her recipe since I couldn’t find mine and then you posted this. I have to use almond butter, non-dairy milk, and non-dairy butter because of my allergies, but these will be even better than I grew up eating. Can’t wait! Thanks again. These look super yummy. Pinning for later! These cookies look delicious! Thanks so much for sharing with Full Plate Thursday and come back soon! Love a quick and easy cookie like this! Need one this afternoon! They look so yummy! Chocolate and peanut butter are always a great combination! These sound and look delicious, my favourite combination. Thanks for sharing at the Thursday Favorite Things Blog Hop. This seems to be an easy and delicious cookie for the summer months as no baking is necessary. I have saved it to my favorites. Thank you for sharing your delicious recipes with us.